2/ World-class factory , do ODM and OEM for famous brands. 1-Never clean your polarized sunglasses with paper towels or clothing, which can leave scratches. Just use clean water and Heptagram's included cloth to clean it. 【TR90 lightweight Frame】---- Unbreakable,impact resistance and flexible TR90 is prized for its combination of lightness and strength.You can hardly feel them on your face, but they are unbreakable.Best for motorcycle and cycling bicycle, driving, running, fishing, racing, skiing, climbing, trekking or other outdoor activities. 【Heptagram polarized sunglasses are suitable for any climate and weather conditions. 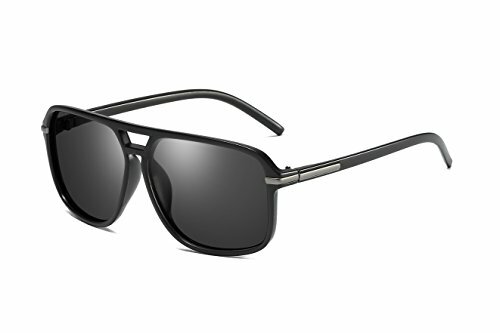 】 ---- Heptagram aviator sunglasses for men women is made of high quality TR90 material and reinforced metal hinges that is durable enough for long time using. 【Includes a Hard Case, suede fabric cloth, Pouch, and Polarized card】---- Polarized card allows you to view the effect of polarized more easily . suede fabric cloth is for keeping them clean. Hard case is for protecting them against press. If you have any questions about this product by Heptagram, contact us by completing and submitting the form below. If you are looking for a specif part number, please include it with your message.